Hi everyone!! 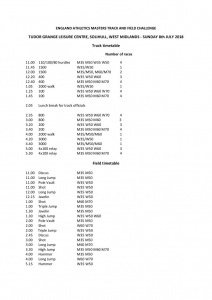 I have the timetable for the EAMA Inter-Area Outdoor Track & Field Challenge on 8th of July in Solihull. The organiser, Arthur Kimber is looking for field and track officials so the competition can go ahead, without them he’ll have to cancel the event. Please contact Carey at emacsecretary@yahoo.com if you can come be on our EMAC team or help officiate. Officials get their travel reimbursed and also provided a meal. Thank you for your time. 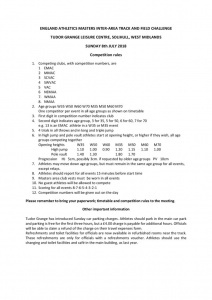 Below are the timetable and the rules of the competition.